Oh, my. 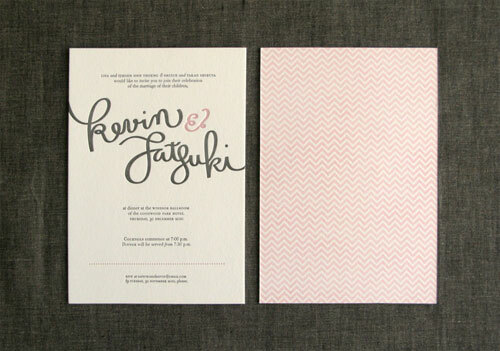 Pink, gray, and creme plus hand-lettering and letterpress? Hello, gorgeous! 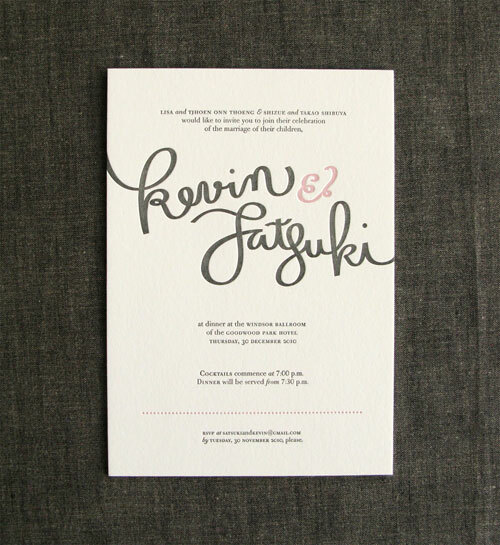 Satsuki Shibuya, who recently launched the Los Angeles based graphic design and product design studio, Zakka Nouveau, created these lovely, hand-lettered invitations for her upcoming wedding to Kevin, and the project was absolutely a labor of love. 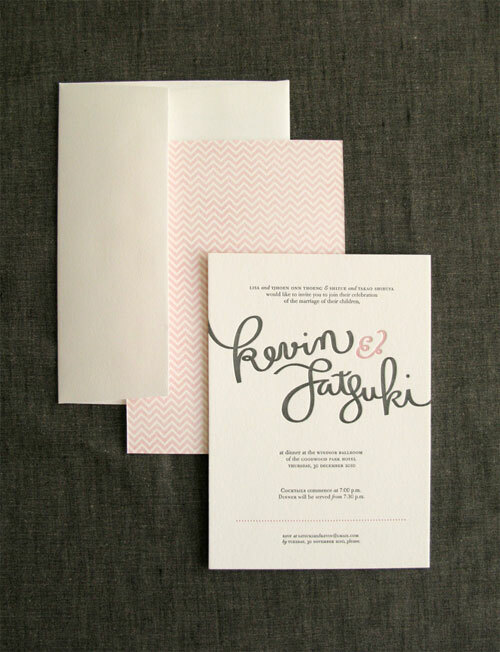 As Satsuki says, she was actually more excited about designing her invitations than she was about finding her dress, and that excitement really comes through in the finished invites. Satsuki and Kevin decided on a one-sheet, double-sided card in order to conserve paper while still conveying the necessary information to their guests, and the couple wanted to incorporate both traditional and modern elements into the design both because they were inviting guests in a wide range of ages and because they sometimes feel like “old folks stuck in young bodies” (I can relate!). The custom hand-lettered names, created by Satsuki, represent the “young”, while the different families of Bodoni used in the design represent tradition. 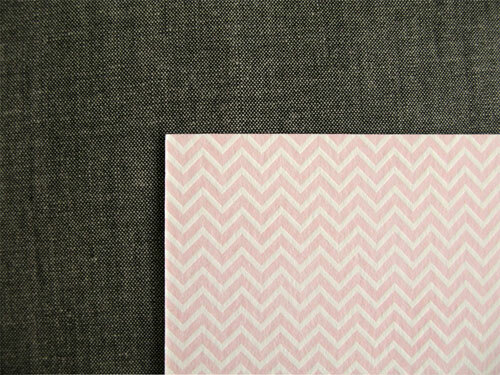 The traditional chevron pattern on the reverse, given a fresh look in pink and creme, ties together all of the elements in this oh so lovely wedding invitation. Soo pretty! 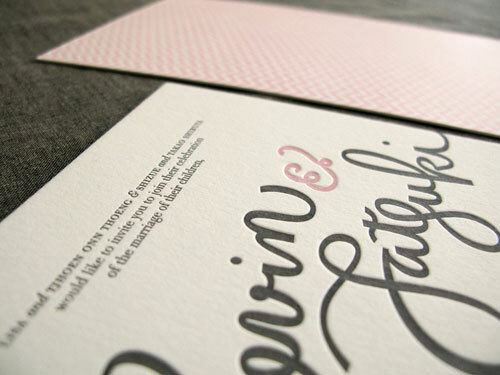 The hand lettering is just gorgeous, and I love the restrained use of color. 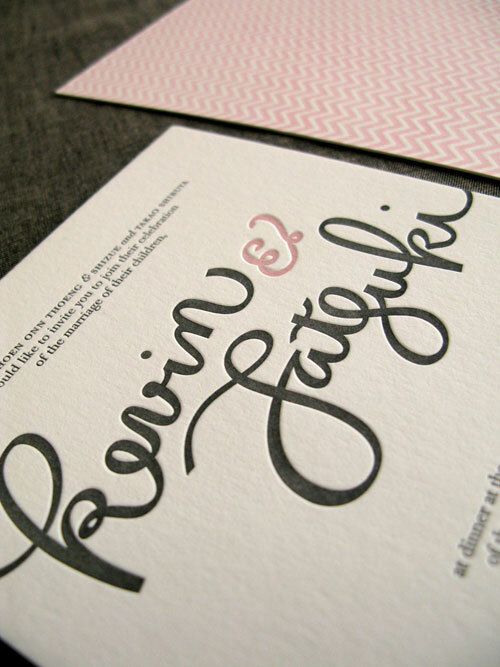 Wow- the pattern is perfect and that hand lettering is to die for! Thanks for finding this. Love your blog – just come across it. it’s really beautiful, love your taste. 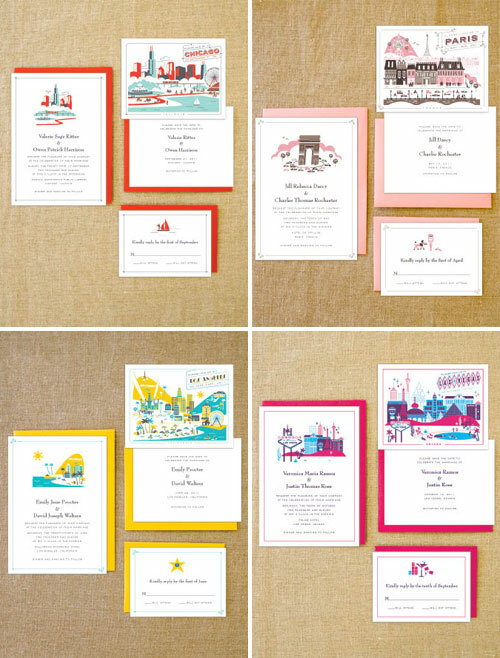 Loooove these invitations more than any I’ve seen.